I was heading out of the market last week towards the bus stop to catch the #22 bus to work when my eye was caught at the Three Sisters Garden stall by a basket of the smallest ears of corn I had ever seen. I was well past them before it registered what they were. 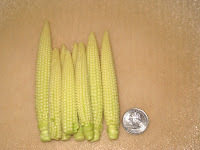 Outside of a can, I've never seen baby corn and these were the cutest little baby ears I'd ever seen. I wasn't sure what I could possibly do with them but I knew I had to have them. So home they came with me. That's a quarter down below the bowl so you have some idea of the actual size of these babies. They were truly tiny. I decided to give them a quick stir-fry with some green beans from The Leaning Shed, along with some toasted almonds for a little crunch. I prepared the corn the same way I prepare regular corn on the cob; I trimmed the ends, rinsed them in cold water, and microwaved them still in their husks. I only cooked them for 2 minutes, and that was almost too long. They actually didn't need to be cooked at all before the stir fry. 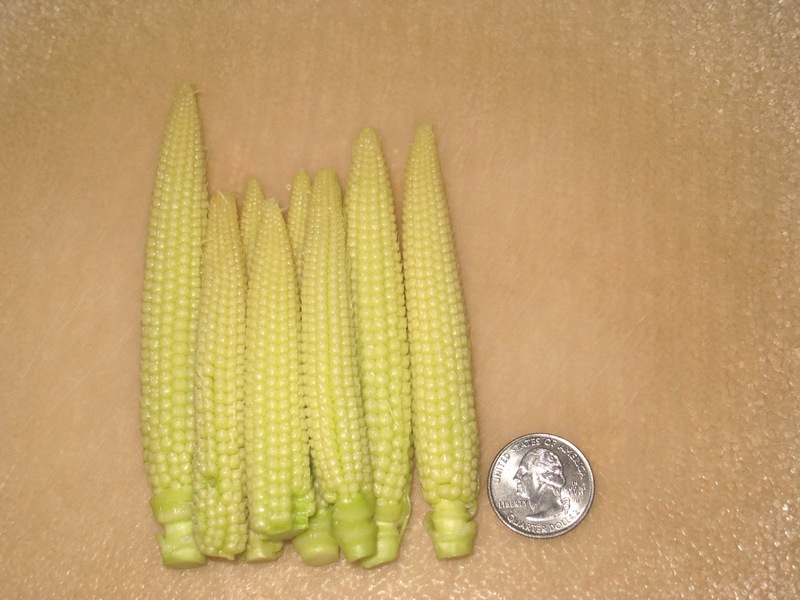 I was concerned that the cobs might be too tough but I did not need to be. They were tender and sweet. For the stir-fry itself I kept it as simple as possible. I washed and trimmed the green beans and broke them into bite-size pieces. I toasted the almonds for about 10-15 minutes in a 350-deg. F. oven while I prepped the corn and beans. Total cooking time was no more than 5 minutes. I am so thrilled to have discovered these. They had more this weekend. Needless to say I brought some home with me. Heat wok until it is smoking. Add 1 tablespoon of the peanut oil and swirl it around to coat the bottom of the wok. Add the green beans and cook for 2 minutes. Add the baby corn and cook for another minute. 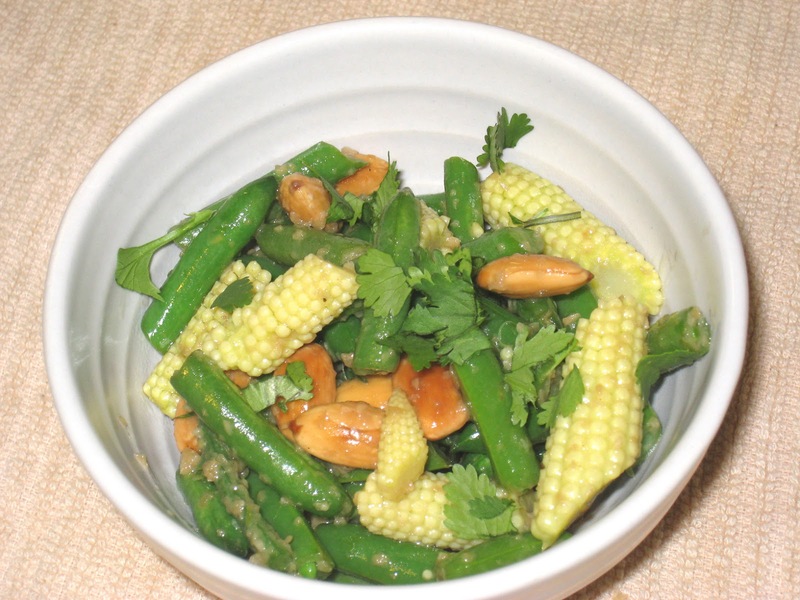 Push the corn and beans to the sides of the wok and add the second tablespoon of oil. Add the garlic/ginger paste and let it sit for a few seconds before stirring it around. Incorporate the beans and corn into the mixture, then add the almonds and cook just long enough to distribute them evenly throughout the dish. Add the oyster sauce and soy sauce and stir to combine. 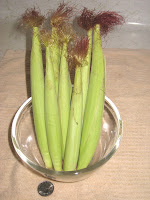 Remove from the heat and serve immediately garnished with cilantro. When it comes to food, I always choosing the nutritious one, because it always making my body healthy. I think this recipe is suited for me because it's very healthy. I will definitely make this.